Window cleaning is a tricky task which is better performed by professionals who have the necessary tools, devices and equipment for work. Our staff of cleaning specialists are trained, certified and possess the necessary skills to ensure safe and efficient washing of window glasses and frames. 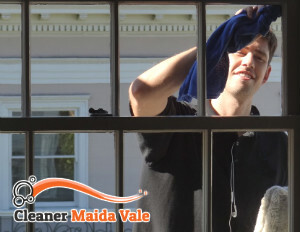 They don’t disturb the customer providing unobtrusive and professional window cleaning in the area of Maida Vale, that is available seven days in the week. Contact us by phone, e-mail or online to book the cleaning of the windows in your property. Our staff check the position of the windows, evaluate the risks and choose the best method for sanitising them. They have been trained to work safely from all kinds of platforms, cradles and using ropes. 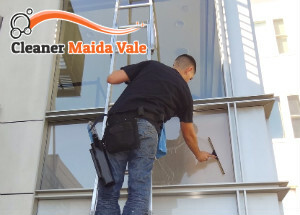 We offer professional window cleaning across Maida Vale W9 done in accordance with the Health and Safety requirements. Use our services which ensure spotless, pristine and shiny external glasses and frames. Our staff can apply conventional cleaning using squeegees, cleaning solutions and other tools. They reach higher windows to 80 feet from the ground using water fed poles and extensions whenever it is necessary. The cleaning is implemented using only purified water that is extracted from the poles and with the soft brush ensure removal of dirt, grime and stubborn stains. The water is supplied from tanks that are mounted in the vans of our cleaning technicians. It cleans and rinses the windows thoroughly and well. We offer excellent cleaning of windows which can also by carried out from cradles, ropes and platforms. The cradles, ropes and platforms are tested and checked in advance to function safely and properly. Order the window cleaning which we provide in W9 and our qualified staff will do the work at a convenient day and time.